Getting the weather is generally an easy thing for most people. Television and radio stations, whether local or national, give such news during their newscasts. There is also the 24/7 Weather Channel. But did you know the National Weather Service is probably one of the most reliable sources to get the latest on Mother Nature’s unpredictable occurrences? The agency operates 122 weather forecast offices spread out in six regions of the country. Its Brownsville office is one of 11 cities NWS runs forecast centers in Texas. The Lone Star State is one of 11 states and Puerto Rico that form the Southern Region. 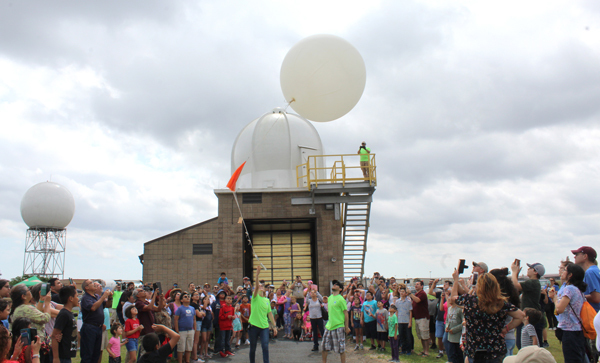 So to let people know what they do and where they are, the Brownsville NWS office hosted a weather festival on Saturday, March 23. Barry Goldsmith, the meteorologist in charge and warning coordinator, said the festival was held with the intent to let people get to know the agency staff and the partner organizations that provide assistance during emergency situations. About 22 people work at the NWS office on Vermillion Road. Rich Hollman, a meteorologist, said whenever a watch is issued, it usually means that weather conditions are normal whereas a warning is an alert telling people to act now and to seek shelter. He and others gave a tour of the heavily computerized communication center. Outside the building were about a dozen organizations, such as the American Red Cross, Texas National Guard, U.S. Coast Guard, Farmers Insurance, Brownsville’s police, fire and EMS handing out pamphlets or providing information. The festival included a release of a weather balloon that rises up to about 20 miles. Such balloons provide valuable information for computer forecast models and provide local data research for forecasters to predict storms. Sergio Juarez, Mary Martinez and others who were at the festival said they had no idea about all the equipment and personnel the NWS office has here. They also said they were glad to know things they wouldn’t have learned had they not attended the festival.